This multi-use and delicate foam dry oil is a key beauty care to enhance skin and hair!Rich in White Grape, grape seeds oil and sweet almond oil, it intenstly penetrates the skin without leaving behind an unpleasant greasy film. regain its suppleness and shine. How to use : Vaporize the dry oil directly on the skin and spread all over the body. Use it morning and night. For hair, vaporize a little of oil in your hand and warm up it. Apply on length of hair. Use it as necessary. Unique fragrance : Fresh, sparkling and and acid-fruity ! 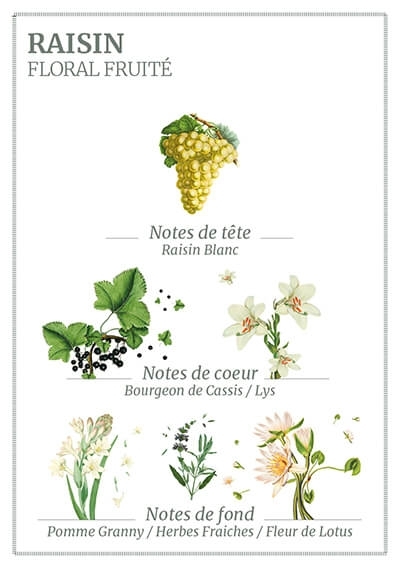 A white grape with lily and blackcurrant bud, sublimated with granny smith apple, lotus flower and fresh grass.